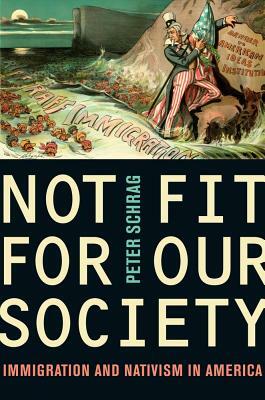 In a book of deep and telling ironies, Peter Schrag provides essential background for understanding the fractious debate over immigration. Covering the earliest days of the Republic to current events, Schrag sets the modern immigration controversy within the context of three centuries of debate over the same questions about who exactly is fit for citizenship. He finds that nativism has long colored our national history, and that the fear—and loathing—of newcomers has provided one of the faultlines of American cultural and political life. Schrag describes the eerie similarities between the race-based arguments for restricting Irish, German, Slav, Italian, Jewish, and Chinese immigrants in the past and the arguments for restricting Latinos and others today. He links the terrible history of eugenic "science" to ideas, individuals, and groups now at the forefront of the fight against rational immigration policies. Not Fit for Our Society makes a powerful case for understanding the complex, often paradoxical history of immigration restriction as we work through the issues that inform, and often distort, the debate over who can become a citizen, who decides, and on what basis. Peter Schrag, for many years the editorial page editor and later a weekly columnist for the Sacramento Bee, currently contributes to The Nation, Harper's, The Los Angeles Times, and other publications. He is a visiting scholar at the Institute for Governmental Studies at the University of California at Berkeley and the author of several books, including Paradise Lost and California: America's High-Stakes Experiment (both from UC Press) and Final Test: The Battle for Adequacy in America's Schools. Peter Schrag is the 2010 winner of the Carey McWilliams Award from the California Studies Association.